The error 0x80240017 is a common occurrence for Windows 10 computer users. It is most probably triggered from a bug resulting from a Windows Update exercise. 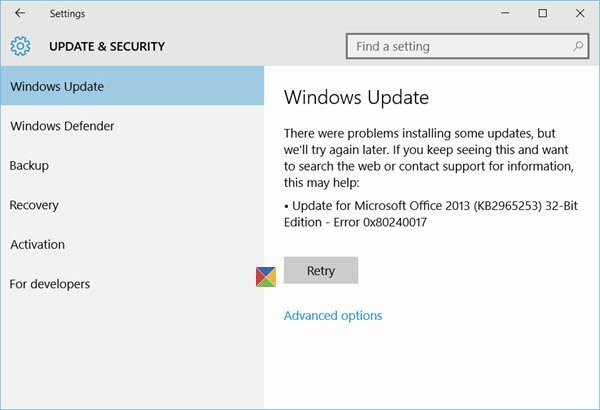 Often, it appears during or after Windows carries out a major update. This poses a worrying predicament for users. A popular culprit happens to be Microsoft Office. However, other updates may also trigger this error. There is some reprieve though; you can work around this issue. On your keyboard, press the Windows key together with X (Win + X). On the appearing menu, select Command Prompt (NOTE: choose the one with “Admin” Option). The above commands effectively halt the Background Intelligence Transfer Service as well as the Windows Update Service. Press Win + E on your keyboard to launch the explorer. Navigate to the directory C:\Windows\SoftwareDistribution. In this folder, ensure that there are no hidden files. Delete all the contents inside the “SoftwareDistribution” folder. In some cases you may not be able to delete several files as they are in use for some processes. Here, you may restart your computer, rerun the commands above, and then delete the remaining items. Ensure that the folder is absolutely clear. These commands will restart the services that you stopped earlier. If you so wish, you may again reboot your computer. Now carry out Windows Update. Windows will automatically download the latest updates and install them. The error 0x80240017 is now fixed. In case of any trouble after this, you can now run the Windows Troubleshooter. if you still facing this issue on window update or any other software please comment below so we can provide solution for that.